A very important cultural event at the 37th PAA Convention in New Brunswick NJ, organized by the Cretans' Fraternity "The White Mountains" , June 2001. The Play was a great success everywhere. Participants had the opportunity to appreciate the great elements and values of our culture as they were also emotionally captured by the Play. People were laughing, were participating and most of all felt happy and respect for ourtraditions, the language, the people and the greatness of their souls. Mihalis Balamoutsos, who so masterfully wrote the Play using the very difficult 15-syllabes style, touched our cultural traditions in a way that was able to bring out the cleverness the humor the sensitivity and most of all our Cretan compassion. The acting cast gave memorable performances and they won our respect and admiration for their humorous, respectful and professional presentation. The director of the Play, Dimitris Fragiadoulakis along with the music written and performed by Michalis Alefandinos gave a different dimension to the Play as they, artistically and esthetically enhanced the performance. 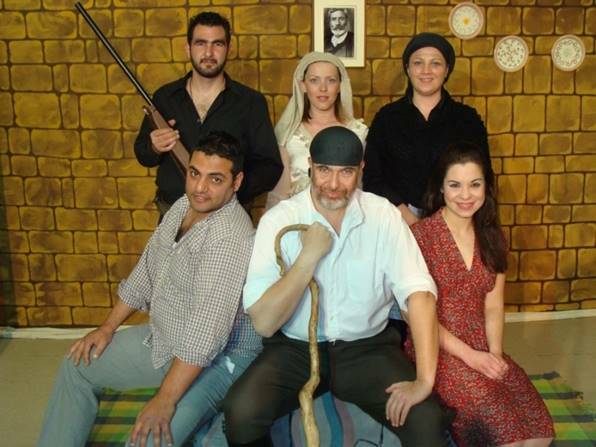 Actors : Michalis Balamoutsos, Vaggelis Mastorogiannakis, Korina Pipila, Manolis Manousakis, Kaliopi Dakanali, Ania Koukaki.